Objective: Identify the types of fire extinguishers and use them properly. 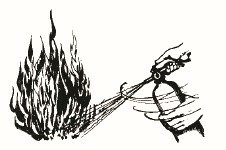 Review the information on the types of fire extinguishers and how to use and maintain them. Point out the placement of all units. Have units available for the training session. Discuss how to read the label, select the proper unit, and how to operate, inspect, and maintain it. Let employees practice using an extinguisher. ABC Multipurpose, combination unit can be used on all three types of fires. The type of fire it can handle, shown by the letters A, B, and/or C.
The size of fire it can handle, shown by numbers. The bigger the numbers in the unit label, the bigger the fire the unit can handle. For example, a unit labeled 2A can handle a fire twice as big as a 1A unit. A 4A unit can handle a fire twice as big as a 2A unit. A 2A:20B:C extinguisher will protect up to 3,000 square feet of area where a moderate fire may occur. This could be a storage, display, or shop area. It is also a good unit to carry on a tractor or a pickup truck. The table shows suggested location, number, and placement of fire extinguishers. The units suggested are 20-pound units. Examine for defects at time of purchase. Find out where fire extinguishers are located. Move the extinguisher as close to the base of the fire as possible. 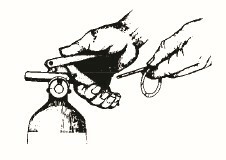 Grasp the hose in one hand and press or squeeze the handle or trigger release with the other. (If the unit is a CO2 extinguisher, grasping the plastic discharge horn may freeze the hand.) If the unit has no hose, direct the stream of extinguishing agent by moving the extinguisher. If there is no pressure when you squeeze the handle, check the metal piece that is hanging downward and engage it into a groove, then try again to squeeze the handle. Use a side-to-side sweeping motion at the base of the flames starting from the near edge to the rear of the fire and then up the vertical surface. Is there enough pressure to discharge the contents of the extinguisher (check the gauge)? Replace or recharge the unit as needed. Is the tamper seal intact? Is the extinguisher area clear of clutter? In case of fire, evacuate the building first. Call the local fire department.